Titan 22 Inch Outdoor Touchscreen - Tech Global Inc. 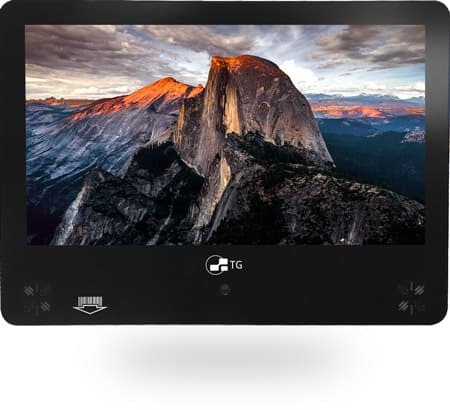 The New Tech Global Titan series is an extremely durable commercial grade outdoor touch screen monitor. Engineered in the USA from the ground up for all weather use with an ultra bright 1500 nits outdoor rated panel. The next generation optical bonding and anti-glare technology provides ultimate clarity even in direct sunlight environments. Integrated accessories include a high resolution barcode scanner, 8.0 MP camera, waterproof microphone and speaker, near field communication (NFC), magnetic and chip card reader for a perfect all in one system. Available in your choice of Windows, Linux or Android operating systems. Safe even in rain, snow, wind, humid, salty air, bug prone, frigid and desert conditions. Provide the next level of safety for your customers. Thermally hardened glass has been demonstrated to be up to 5x stronger than untreated glass. No plastic is used on the outside of the display for ultimate protection against weather conditions, corrosion, warping and cracking. Boost your customers’ user experience with clearer and easier to read display to remove frustrations common in bright outdoor settings. Prolongs the life of the display with an intelligent heat management system that utilizes custom PCB design, commercial grade heat sinks, and Titan air cooling engine. Provide a vibrant and consistent viewing experience at virtually any angle by laminating the glass directly to the LCD. The optical bonding process reduces internal reflections and glare by over 70%. Chemical etching process further reduces external glare making the display easier to read even in extreme conditions. Achieved by removing the air between the glass and the LCD for a fully sealed system. Will not fog up in humid and moisture prone environments. Others may use consumer grade displays that are not designed to operate more than 6-8 hours per day. Our displays utilize 100% commercial grade components for 24/7 operation. Delivers a brighter and sharper picture to your customer. Commercial grade LEDs effectively overpower any glare to produce the clearest possible picture. Industrial Heating and Cooling elements provide optimal thermal regulation from 140°F to -40°F for maximum reliability and longevity. Commercial grade panel is shielded from dark spots that occur when the display is exposed to UV rays from the sun. Experience Ultimate Clarity With Titan IRIS Technology, The Next Generation In Optical Bonding. How Does The Titan IRIS Technology Actually Work? The Titan IRIS technology consists of 3-step process that is designed to provide a clearer, sharper, and brighter image in outdoor environments. Nothing else compares to the Titan IRIS technology - guaranteed! The first step is to minimize the reflections of the glass itself. Glass is naturally highly reflective. A proprietary chemical etching process is used to drastically decrease the external reflections. The chemical etching process is permanent and extremely durable that will never peel, crack, or distort over time. But we did not stop there; we took it a step further and developed a custom technique to optically bond the display with the latest refractive adhesives. This is achieved by completely removing the air-gap between the cover glass and the LCD panel. This reduces internal reflections by over 70% as well as strengthens the display as a whole. Next the brightness is upgraded with commercial grade LEDs achieving 1500 nits that will overpower some of the brightest environments. The display’s video processor is then calibrated for optimal color, contrast, sharpness, brightness, and gamma to provide the clearer and easier to read image to your customer in outdoor environments. 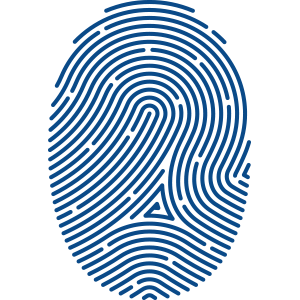 The Titan features 10 point multi-touch projected capacitive technology ideal to future-proof your touch applications. The built in touch redundancy engine solves unintentional touch activations by measuring the capacitance multiple times every millisecond. This means that contaminants on the screen such as water, dust, or even bugs will not set off a touch activation minimizing input errors. Projected capacitive technology is extremely stable, accurate, and provides a rapid touch response (clocked at under 5ms). Driver-less installations and drift-free touch points reduce the cost of implementation and maintenance. 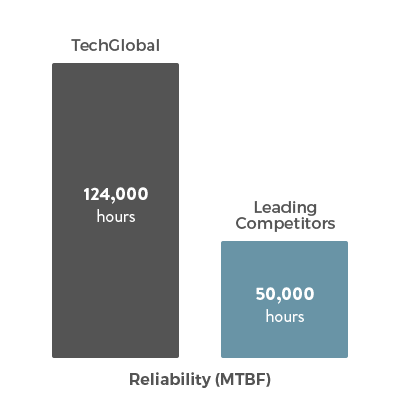 Take reliability to the next level with 124,000 hours MTBF (mean time between failures). That is over 11 years of reliability in 24/7/365 always on environments. Comes standard with a 1 year hassle free commercial warranty that covers outdoor use. Add additional protection with our extended white glove service plan. Tech Global products are designed and assembled in the USA. A truly all in one system that works right out of the box. Avtec Inc. has used Tech Global to supply us with touchscreen monitors for over three years. We began our relationship with contact at an industry trade show, and now Tech Global is our sole provider of touchscreens that include standard 19 and 22 inch Tech Global models as well as Avtec customized touchscreen. Avtec deploys equipment in mission critical 7/24/365 environments such as command and control centers for major Airline, Railroad, and Utility companies. We also support many Public Safety environments: Police Department dispatch, Fire Department dispatch, and 911 support centers. In these mission critical environments, quality -robust products are imperative.  Avtec sees Tech Global as one of its top tier suppliers that provide quality product with unparalleled service. We consider Tech Global a valuable partner, and look forward to working together for many more years. Talk to our touch screen expert to get a cost effective solution around your application.